Summary: Profitability and environmental stewardship are key to retaining cotton as a viable crop in the United States. Cotton prices have necessitated that our growers become more efficient if they intend to keep cotton as a part of their crop rotation. 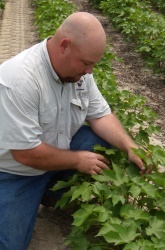 This presentation will consultants, growers, and other practitioners in the Southern U.S. cotton-producing states to understand more about nitrogen application and the long-ranging impacts of applying this nutrient on the entire cotton production system. Specifically in this presentation, practitioners will learn the effects of over application of nitrogen on cotton growth, development, and yield. In addition, data will be presented showing the effect of nitrogen application on infestation from tarnished plant bugs. By the end of the presentation, the practitioner should know more about how nitrogen is partitioned in the plant as well as see the effects of nitrogen application on cotton growth and yield.